Today Elena bought a mouse. The type on the left, not the type on the right. 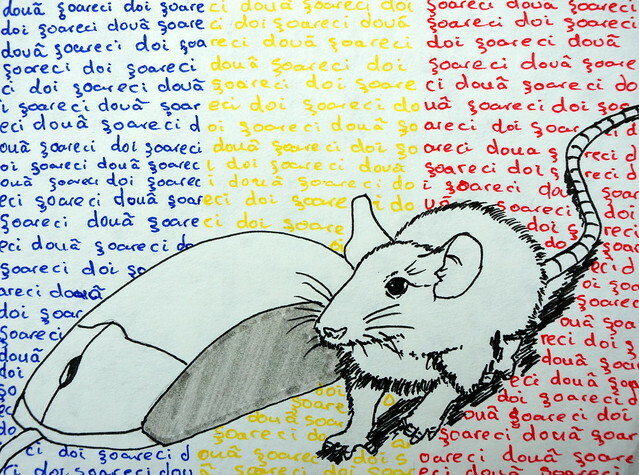 The Romanian word for “mouse” is “șoarece” or “șoareci” for mice, but they call the computer mouse a mouse, using the English word. We’re in Iasi, Northern Romania on the 2nd day of our holiday staying with Elena’s brother and Elena needed the hardware peripheral for her laptop. We plan to bring our laptops with us to blog and do techie stuff on the way as this career break is partly about travelling and partly about learning things as Elena wants to learn more about databases and I want to teach myself to program. I started to come regularly to Romania in 2005 and since then I’ve probably been here about 10 times, but despite this I still have a pretty rudimentary grasp of the Romanian language. I’ve never been great with languages. When I first came to see Elena’s family in Romania they took me to the country house and when we opened the door there were two mice dead on the floor in the middle of the landing. Trying to impress the family with my Romanian, I said “Look, doua șoareci”, at which point the whole family fell about laughing. “What have I said?” I wondered, thinking that I’d really put my foot in it. If you ask me, they look pretty feminine to me. What do you reckon? Mice – do they look masculine or feminine to you? Definitely masculine! There was an article on public radio here in the States a while back about languages that have gendered words. Is “bridge” masculine, feminine or neutral in Romania? That’s a really fascinating article Postmuse. I always suspected that noun genders have an effect on the way we think. As non-gender speakers I like to think I view all objects quite neutrally,and found the bridge question quite hard. I described it as red, long and useful. I think of beautiful, graceful and connecting. Fairly feminine I suppose. Your descriptors are utilitarian, which is probably a better way of looking at objects. Great article indeed. Even though English is technically gender-neutral, I remember when I first came to the UK I was quite freaked out by a kids’ TV programme called The Bear in the Big Blue House which featured two characters called shadow and Luna (the moon) which were both female and hence threw me and the assumptions I had built up as a native German-speaker where both nouns are masculine. Well, in Spanish a mouse (“ratón”) is masculin, but a rat (“rata”) is feminine. Isn’t a raton what you call a computer mouse Rafa? Do you guys call windows (the operating system) windows? When do you decide that something should be spanishized? In Sweden (which has 2 genders that seem randomly applied, “Things with a gender” and “Neuter”) whether something gets Swedised or they just use the English word depends on who starts to say the word in the first place, if it’s kids or scientists then they’ll almost always use the English word and it sticks because the kids tend to think of Swedish as a bit of a fuddy duddy language and the scientists are used to working in English. In Iceland though there’s a department of language who make sure to come up with an icelandic name for everything, which is awesome. So while in Sweden electricity is just “el” in Iceland it’s “rafmagn” which directly translates as “amber power”, likewise computer in icelandic directly translates as “digital seer(ess)”. That’s it from me, been lurking for yonks and thought I’d say hi, hope you have an awesome time on your travels.